Police in Ballymena are appealing for witnesses following a petrol bomb attack on a house in the Alfred Street Place area of the town earlier today (Friday 21 April). Detective Chief Inspector Dunny McCubbin said: “We believe that a petrol bomb was thrown at the property around 3.45am this morning. Three adults and a 12 year old boy who were in the house at the time were uninjured. “A window in the house was smashed and scorch damage caused to an exterior wall. “Anyone who saw anything suspicious in the early hours of the morning should contact detectives at Ballymena on the non-emergency police number 101, quoting reference 147 of 21/4/17. North Antrim DUP MLA Paul Frew has condemned the attack and said it had caused widespread shock. Mr Frew said: “Thankfully nobody was injured in this attack, but we could have a very different story emerging from this area today. “I understand the family were at home during the time of the incident, which caused extensive damage to the kitchen. Gas pipes were also damaged and could have caused loss of life. “I know many in the community including myself, cannot understand why this family home has been targeted in this way. 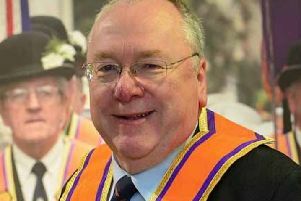 Commenting on the incident, TUV assemblyman Jim Allister said it was a ‘mindless act of criminality’. “It could have caused serious injury or death, and fires can spread which could have endangered even more people living in this community. This behaviour is not wanted in our society, and if anyone has any information please contact the PSNI.